Since Kuroda will appear next case, we are likely to get more clues(which I can't for), and since he noticed Rumi, maybe we will get some juicy plot development(or maybe it will even lead up to a bigger BO case). Even just having people simply want to know who rum is is enough but they probably don't realize this themselves. About the hand mirror, it was assumed that it was Haneda's because it was found in his room and only his fingerprints were found on them. I'm assuming that from the fact that everything was proofed for fingerprints. If there were another fingerprint on it that person would be the suspect. Now, how and why did a cleaned off hand mirror got to Haneda? Because it was with Asaka before. Unless there are two mirrors and they are totally not related. But then would Haneda really need a hand mirror? For his looks? If he was concious about that that much he would have switched his glasses to contacts. I believe. And why wasn't Amanda Hughes on the Aptx list? Her death was also caused by 'unidentified cause'. Why was Haneda on it, but she wasn't? She is supposed to be the main target. Or her death was as true as Sharon's? Sorry for not having any ideas for these questions, I just thought that they might be relevent. Misztina wrote: About the hand mirror, it was assumed that it was Haneda's because it was found in his room and only his fingerprints were found on them. I'm assuming that from the fact that everything was proofed for fingerprints. If there were another fingerprint on it that person would be the suspect. We don't really know if there was any fingerprints or not, because we don't even know how much the uploader revealed in the website. Even if there was someone else's fingerprints, if there's nothing to compare it with, it will simply end up being a mysterious fingerprint with no identity. If Asaka is a woman, and she fled after Rum and Tsutomu left, then it's also possible that she removed her fingerprints out of desperation(thinking that she might be blamed). 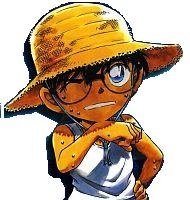 Overall, my rule of thumb is that Gosho always delivers the information that is important and relevant to the solution, meaning that the fact that fingerprints wasn't mentioned likely means that it's less likely to be relevant, so the important ideas that were thrown out by Haibara(by Gosho) is currently the only clues we have about how Kohji got it. Misztina wrote: But then would Haneda really need a hand mirror? For his looks? If he was concious about that that much he would have switched his glasses to contacts. I believe. Since Haibara adressed the likelihood that it's his(due to Shogi players caring for their looks), I think it's a safe bet to assume that he used it, and that it was probably given to him by a woman. I don't think Gosho would go to such lengths to explain why Kohji probably used it unless it's the truth(judging by Gosho's case-exposition pattern). Glasses being considered bad-looking is not a universal truth. Misztina wrote: And why wasn't Amanda Hughes on the Aptx list? Her death was also caused by 'unidentified cause'. Why was Haneda on it, but she wasn't? She is supposed to be the main target. Or her death was as true as Sharon's? Just because it wasn't in the same list as Shinichi doesn't mean it wasn't in a list at all. Maybe Sherry just remembered Kohji's name because Shinichi's name was two rows above it(and she had checked his list more than once, due to his disappearance). You brought up good points, so don't worry about it. Well, if, as Serinox said, that guy with glasses in 987 mentioning he has an artificial eye is what prompted Rumi to get all serious, then I'd say this is a play by Gosho to trick us into thinking Rumi is BO. Therefore, with the 987 spoiler pics and translation (that we have so far), I'd say the Rumi = Vermouth theory has gone down my probability of occurrence, thus increasing the odds that she's actually Asaka. In fact, now we have an example of how Gosho draws an artificial eye. The guy with glasses doesn't have an artificial eye, he says that his eye was badly damaged and they were about to give him a fake eye but in the end there was no need to so it's his natural eye. Nevertheless, his mention of an artificial eye seems to have been what triggered Rumi... all the while, though, I'm sure Gosho undoubtedly would have us believe, instead, that Shiho's/Ai's BO sense is back—a classic misdirect, on his part. Agreed. It totally looks like it. We were talking about this in the spoiler cbox but it seems that the SFX in that scene isn't the same as the "BO radar" so it's something else. Good point. But this time Conan seems to detect something. Maybe it's Haibara's reaction and he glances behind her to try to figure out the source. But you still think Gosho's trying to mislead us, right? Yeah, basically. I'm pretty that this is Haibara's BO sense triggered, but as we saw with Okiya/Akai, it doesn't necessarily tell us about that person's true allegiance. So either Haibara's sense has degenerated due to her feeling safe after the MT and she just responds to Rumi's anger and sudden tensing up instead of strictly getting it from BO members, or Rumi was in some capacity a member of the BO before, but currently isn't anymore. Imo, it's highly unlikely she is still a BO member now, even more unlikely is her being Rum. I believe it's the lingering scent of a BO member/rat that Gin really likes. Maybe Gin could detect Haibara before because of his own BO sense. A true superpower. Well, it might as well be Vermouth or Bourbon in disguise, no? - "Words are like sharp knives - if you use them in the wrong way, they can transform into ugly weapons." Muke wrote: Well, it might as well be Vermouth or Bourbon in disguise, no? 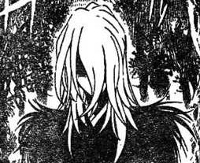 I find that unlikely—why would Vermouth get all angry over the mention of an artificial eye? Why would she get all angry at the mention of a characteristic of Rum? This scene has reduced the odds of Rumi being Vermouth even further, for me. Anyways... this is getting ridiculous if Rumi is the source of causing Ais reaction. 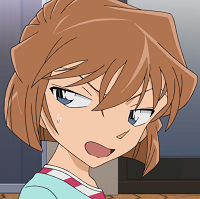 Haibara wasnt triggered by Rumi before and suddenly - due to some random memory/rage-emotion - she got triggered. Even it it´s Vermouth or Bourbon, which i highly doubt, it wouldn´t make any sense, since it would be kinda impossible to turn on/off their bo-aura. Until now i was sure Wakita is going to be a bo-member since Ai hasnt met him yet (and due to it coulnt react in her style) but met Rumi, Kuroda. Only way to save this would be to flashback and show Wakita or any other bo-member hiding behind some trees or anything. Otherwise we have some "on/off-i think of the bo"-aura-thing which I rly dont favour. Lets hope for some satisfying solution.